1. Grab a good friend, or two or three. 2. Fill the car with gas. 3. Pick up a passport at your favorite quilt shop on the tour. 4. Spend the next three of four days traveling the byways that connect the eight shops. 5. Be sure to stop to eat along the way; take in the beauty of the country side. 6. Shop, chat, tell stories, laugh. Central Virginia's 12th shop hop is history. I am happy and tired. I spent last Tuesday afternoon with the owners of the seven other shops talking about this years tour, and drawing names for the wonderful prizes. And there were so many of them---really good prizes. I always enjoy tour weekend. I see old friends come through our doors, and lots of new travelers as well. The mix is so much fun, however exhausting it might be at the time. This year, the challenge for me was to get the quilt together. Each shop had the same pattern, and the same fabric. But we could use our fabric anywhere in the pattern that we wished. I am used to taking fabric and doing what I want with it. This year I had to follow the rules, and the pattern. I still did it my way, but still by the rules. And I am happy with the result. Not the quilt I would have designed, but a very beautiful use of pattern and fabric. The gift for me this year was that by the Monday before the tour began on Thursday, the quilt was finished. Quilted, bound and ready to hang. And I was not running around like a mad woman trying to finish my original pattern. There are some things for which I am grateful. At the end of events, I find myself wondering what it would be like to travel this shop hop, be a mouse in someone's pocket, and hear what everyone is saying. I have been in almost all of the shops, but the excitement and laughter I hear coming through my shop doors makes me think it would be fun to do the tour myself. 1. 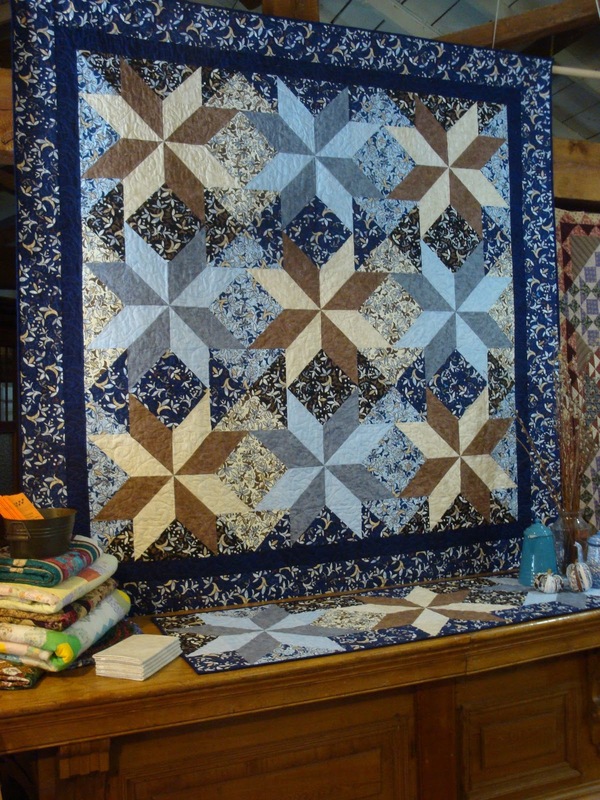 Grab a friend or two or three, fill the car with gas, and head out on a quilting journey.